Another weekend almost over. I can't wait. They've turned into this extended waiting game you see. I dare not commit myself to any of my own projects although there are a couple I really need to start on - the PGTLHE assessment predominantly - because I keep expecting to have to spend time in valuable family mode, especially as it's Mother's Day here in the UK. I thought we'd all be watching a film of Mrs Hora's choice this afternoon, with tea and more of the delicious 'hidden tiger' chocolate orange and vanilla cake Josie's made. But Mrs H is 'up, up' in the land of jazz noodling. Josie made her breakfast in bed first thing, and then the three of them have been painting the new garden fence. Apparently it's a blue colour, looks pale green to me. It's nice though. The children have been told they can earn £5 per hour and that's got them doing something good at last! So, I've been messing around on the new laptop. Have to say the apple experience has completely won me over already, just over a week into it. A few odd bits, not sure i'm quite on top of my yahoo mail account as yet, seems easier to do that side of things on the iPad strangely enough. But for everything else, and in particular, the sharing of docs, the two are functioning brilliantly. I'm also getting used to twitter, not sure quite why I need it, seems the same as Facebook to me, and i'm not the best user of that I'm sure. Back to what I have done this weekend. Plenty of shopping, food shopping that is. And cooking, still wading through the low-fat feast book and others, sticking to low calorie delights. Chicken with spinach and feta tonight. Tons of washing up. The others have forgotten it ever needs doing I think. Not that that matters. I don't mind getting it done and keeping the kitchen tidy, especially as I'll be cooking in it shortly. 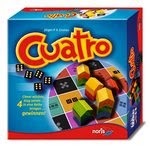 I've learned to play a new game I received from Germany yesterday, 'Cuatro'. A colourful, if simple, dice-fest - yeah, I know they're far from my favourite type of game - but this is ok. A grid of thirty-six squares with six different ways to score your five dice; five of a kind; four; three; two; three of one/two of another; run of five. You achieve what you can with up to five throws of your dice and then place a wooden roof on the grid. The interesting bit is being able to build on top of other's roofs. You can build on top of someone else if you match the dice throw, but have done so in only four rolls of the dice to build on the second floor, or three rolls for the third, and so on. The objective is have four roofs in a line, or have built on the three 'five of a kind' square, or by having the most points after fifteen rounds have been played. Again, the scoring is interesting with multipliers for the height of your roofs being the key factor. My practice game solo was pretty poor. I'm more hopeful it will be better with competition! Was emailed earlier by Henry of Grublin Games. They have a new game they're testing at the moment and he was hoping I might have been able to take it to the International Table Top Event next weekend in Reading. Unfortunately, we're at a family 70th birthday celebration and then i take the children for a few days in Suffolk with mum, so I declined. I offered to take the game to the IBG though, fingers crossed he lets me. 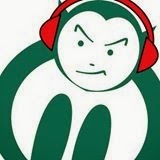 Would be nice to test a prototype out, help them further with their plans. Have spent the rest of the weekend dreaming that at some stage in my life I'm going to get into wargaming in a big way. And therefore, I should now be investing in some or all of the following; A Distant Plain, - about Afghanistan, I already have Andean Abyss and Cuba Libre in GMT Games' COIN [counterinsurgency] series - Sekigahara, - about the unification of Japan aeons ago - 1989 Dawn of Freedom, Labyrinth: War on Terror, and four of the Combat Commander series. They're expensive at £40 - £60 a throw, but are lavishly made and the rulebooks all well-written and they have beautiful maps and I really don't need any more games do I? But how long will these be around for, the print runs seem pretty limited by GMT. But am I ever going to play them? Doubtful, to say the least. There we go, mind made up! Football's a bit lame for me this weekend too. Ipswich had two superb wins in the last week but could only manage a draw yesterday so remain in eighth position. Close to the play-offs but it may be too late. As for other scores, with the exception of Norwich and Chelsea losing, pretty disappointing. Was interested to read that an Italian referee changed his mind over the awarding of a penalty after some five minutes of discussion in a Roma game. Not good for football that.